Resolution of patients’ symptoms and hypothyroid signs, including biological and physiologic markers of hypothyroidism. Achieve normalization of serum thyrotropin (TSH) with improvement in thyroid hormone concentrations. Avoid over treatment. Possible hyperthyroidism. Benefits: Efficacy, long-term experience of benefits, favorable side effect profile, ease of administration, good intestinal absorption, long serum half-life, and low costs. Effect: Increases metabolic rate, promotes gluconeogenesis, increasing utilization and mobilization of glycogen stores in addition to cell growth and differentiation, aid in the development of brain and CNS, and stimulate protein synthesis. If possible, take 1 hour before breakfast (helps to prevent insomnia) or 3 hours or more after dinner. Interfere with absorption: Calcium (e.g., TUMS, Rolaids), magnesium, Fluoroquinolone antibiotics (e.g., ciprofloxacin), charcoal, grapefruit juice, high fiber diets. Increase clearance: Anti-epileptic drugs (e.g., phenytoin, carbamazepine, phenobarbital), antimicrobial agents (e.g., stavudine), and sertraline. Peripheral metabolism: Glucocorticoids (e.g., Prednisone), Beta-Blockers. Different brand preparations can very slightly and switching manufacturers can result in inadequate treatment. Dosing: Based on clinical response and serial (every 1-2 weeks) laboratory measurements. American Association of Clinical Endocrinologists suggests a mean dose of 1.6 mcg/kg of ideal body weight. Initial dose is typically 50 mcg with slow titration every 2-3 weeks of 12.5-25 mcg/day. Usual dose is 75-125 mcg/day. Patients > 60 years and those with ischemic cardiovascular disease should start at a lower dose. Adverse Reactions/Side Effects: Usually seen when excessive doses cause hyperthyroidism (thryotoxicosis). Clinical benefit: Usually observed in 3-5 days, plateauing at approximately 4-6 weeks. American Association of Clinical Endocrinologists recommends treatment when TSH levels > 10mU/L and the patient presents with a goiter, or antithyroid peroxidase antibodies. Due to the likely hood that these individuals are most likely to later progress to clinical hypothyroidism. Lower dosing is used (35 to 50 mcg daily). Follow-up is identical to clinical hypothyroidism. Routine pre-pregnancy and prenatal work-up is recommended. During pregnancy, some may develop hypothyroidism as a result of development of thyroid antibodies. Untreated, increased risk of spontaneous abortion, preeclampsia, anemia, postpartum hemorrhage, and low birth weight. 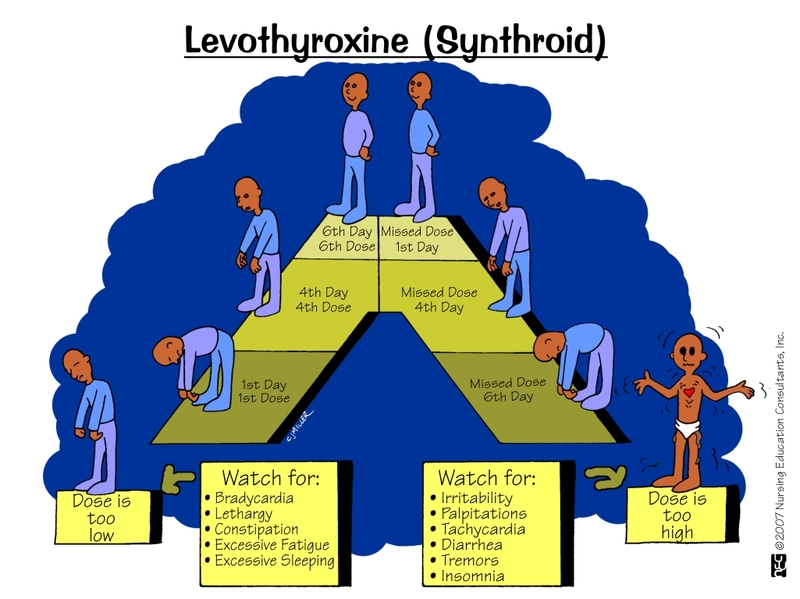 Levothyroxine is safe for use during pregnancy and lactation (Class A).